There were two brothers—identical twins—and though I loved them both, my soul belonged to only one. Annalia DelValle has loved Preston Sawyer all her life. The daughter of an impoverished migrant farmworker, she grew up as an outcast in what was no more than a tiny, cooped up shack in California’s Central Valley. But her heart found freedom in the land, in the wide-open spaces of Sawyer Farm, and in the boys who were her only friends. THIS IS A STAND-ALONE SIGN OF LOVE NOVEL, INSPIRED BY GEMINI. New Adult Contemporary Romance: Due to strong language and sexual content, this book is not intended for readers under the age of 18. Wow! 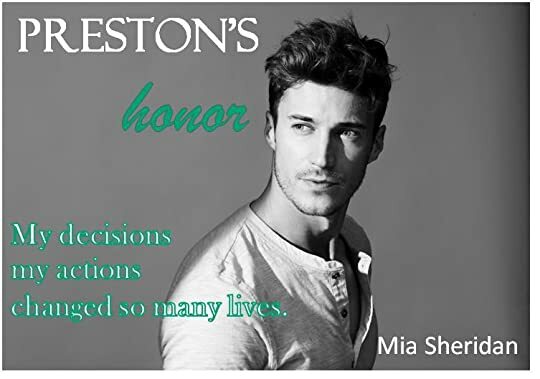 I utterly adored “Preston’s Honor.” I love Mia Sheridan’s compelling storytelling as she has such a gifted way of writing that has the ability to draw me in from the first line right up until the very last. “Preston’s Honor” is part of the “Signs of Love” series based on the zodiac sign of Gemini and it did not disappoint. Still to this day Mia Sheridan’s story “Archer’s Voice” is one of my all-time favourite books and this sets the bench mark for the very high expectations I have each time she releases a new book. This is a story of the Sawyer brothers, Preston and Cole, who also happen to be twins and the special friendship and bond they share with Annalia (Lia), the daughter of an illegal immigrant farm worker. Growing up together they have a love that spanned many years. Preston and Cole’s family owned a farm in a small town in central California and Lia’s mother once worked for the Sawyers. Even though identical twins, Preston and Cole were as different as night and day. Cole was the fun loving, carefree and easy going brother whereas Preston was more serious and thought provoking. Preston rarely smiled and had piercing eyes that literally shook Lia to her very core. Lia has not had the easiest of lives. She’s always had a sense of feeling unwanted, unloved and being an utter disappointment. Her only escape was sneaking off to play with the Sawyer brothers; they were the light in her dark world. “Preston’s Honor” is told in both the past and present day which was pivotal to the story and the plot, as it gave the reader a full insight into all the emotional chain of events which ultimately changed the course of their lives forever. I’m going to keep this review short and sweet as I don’t want to go into all the intricate details of the plotline, because I believe this story should be devoured spoiler free. I really enjoyed this emotionally gripping story about love, loss, family, honor and making the ultimate choice. I would definitely recommend this story to anyone who loves their contemporary romances that pack a punch. Lia and Preston’s story is so poignant and breathtakingly honest you can’t help but be drawn into each and every beautifully written word.